Journey southwards from Buenos Aires down to the Los Glaciares national park continuing to Torres del Paine National Park with plenty of time to explore the trails and soak in the scenery. Culminating in a secluded luxury lodge in the heart of Patagonia, this truly visits the highlights of the region, making it perfect for that special occasion. When you arrive into Buenos Aires international airport you will be met and escorted to your hotel. 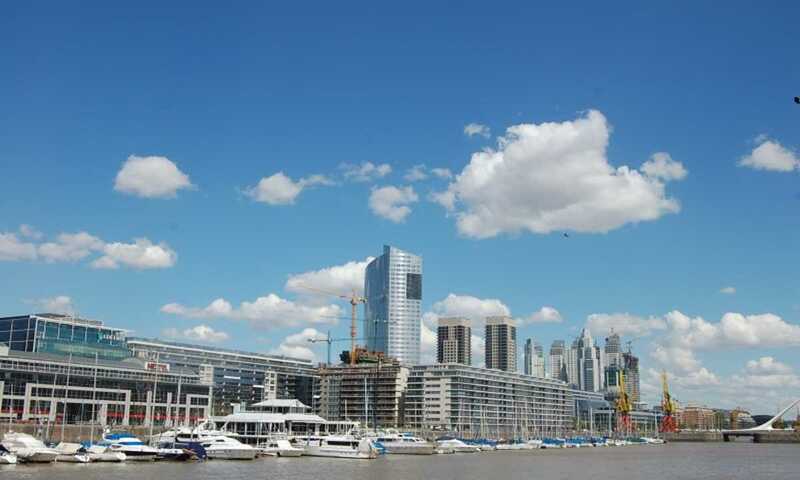 This morning you embark on an exclusive look at Buenos Aires, in which a professor of the University, uses four parks and plazas of Buenos Aires (Plaza de Mayo, Parque Lezama and La Boca, Plaza San Martin and Recoleta) to introduce you to Argentina, its history, contrasts, contradictions and the characteristic psychology of the porteños, the inhabitants of Buenos Aires. Plaza de Mayo: The heart of the city of Buenos Aires, both from the historical and political point of view and the site of its foundation. Parque Lezama & La Boca: One of the oldest districts in the city, crowded by artists, ateliers and colourful houses of rambling architecture at La Boca and lots of antiques shops and cobblestone streets in San Telmo, which showcase the early times of Buenos Aires. Plaza San Martin & Retiro: Shows the link and the passage from the Old South to the New Residential quarters developed at the turn of the 19th century when Argentina and especially Buenos Aires looked towards Europe as a model. The rest of the day is yours to explore further, or perhaps take a stroll in one of the many beautiful gardens in the Palermo area. Today is free for you to soak up more of this wonderful city. *If you'd like to add on a night of tango whilst you are in Buenos Aires, please do let us know. This morning you will be taken to the airport for your flight to El Calafate, Patagonia. You will be met when you arrive at the airport in El Calafate and driven by road to the Aguas Arriba Lodge. Hidden away on the eastern shore of Lago del Desierto, this lodge is a wonderful base for exploring the surrounding scenery. En route to the lodge, you will drive around lakes Argentino and Viedma. Look out for Mount Fitz Roy looming on the horizon as you approach El Chalten – it is arguably one of the most beautiful peaks in the Andes. The lodge is reached by crossing the lake in a small boat. When you arrive, your hosts will welcome you to the lodge, where you can enjoy lunch with views over the lakes and mountains. Once settled in, you are free to do as much or as little as you like. Expert hiking guides are on hand if you wish to explore some of the trails. You can also explore the lakes by boat. Fly-fishing is also available. Another day at Aguas Arriba lodge, free to choose what you would like to do there, if anything. This morning you will make the return journey across the lake and then back to El Calafate by road with your private transfer. The Patagonian ice cap is the 3rd largest in the world after Greenland and Antarctica. Magnificent rivers of ice descend from it which then melt to create the characteristic turquoise lakes, dotted with icebergs, such as Lago Argentino. El Calafate lies on the banks of el Lago Argentino and has some excellent restaurants serving traditional Patagonian lamb, among many other dishes. This morning you will join a guide and small group for your trip to get right up close to one of the largest and most impressive glaciers in Patagonia, Perito Merino. A series of walkways take you to fantastic viewpoints where you can watch out for huge chunks of ice breaking off the glacier, creating a spectacular show. A boat takes you over to the shore on the opposite side of the lake where your guide will help you to kit up with crampons for a hike on the glacier itself. This morning a representative from Tierra Patagonia will be there to meet you at your hotel in El Calafate and take you on a shared transfer to Torres del Paine National Park, Chile. As you get out into the wilds of Patagonia and closer to the park, you may spot guanacos grazing and condors flying overhead. When you arrive at the hotel, your base for the next few days, relax and have dinner while watching the sun set over Torres del Paine. You may choose from a variety of excursions as part of your stay here. The expert guides will explain the options in detail so that you can decide which ones you wish to join. There is also a superb spa at the hotel. This morning you will head south to Punta Arenas and take your northward flight to the Chilean capital Santiago. When you arrive, you will be met and escorted to your hotel. There is plenty to see and do in the city so we'd recommend checking into your hotel and then heading out to explore. Please let us know if you would like any restaurant recommendations, or a reservation for this evening. Today you will be escorted to the international airport for your flight home. This trip can run as a group trip, with prices starting from $7,900 per person for a complete group. If you are looking to join a group or you are a solo traveller we will help to form likeminded groups of travellers. Please let us know your travel plans. This trip is a private trip and can be set up on any date of your choice (depending on availability).